The Greek word translated "cross" is "stauros" which means "an upright stake" (underline is mine). Since wood does not survive time well we are limited to images of that time for a more accurate rendition of this method of execution. It would seem, from those images and archaeological findings that the Greek capital letter 'tau' which is a T more accurately depicts the shape used. The image on the left comes to us from Puteoli, Italy. This is logical from the perspective that making a t is much more complex to fabricate theT would be. Another point is the way the feet were nailed. 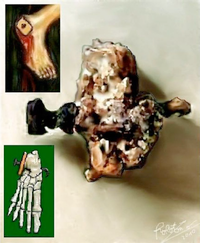 The image to the right shows the feet attached to the sides of the "stake." Archaeological evidence of an ankle bone with a nail through it suggests too, that the the feet were nail on either side of the stake. This is not meant to taking anything from the symbol of the cross and especially its world changing affect, it is simply information for those who find satisfaction in accuracy and how this might affect our understanding and interpretation of other potions of scriptures.